I love a good pair of pyjamas. There’s just something so cosy and comforting about getting into your pyjamas at the end of the day (or earlier!) So I was super excited when The Pyjama Factory contacted me asking if we wanted to review some of their pyjamas! I spent far too long looking over the website, which has a vast array of pyjamas. Something for the Harry Potter fans, Gamers, plenty for Disney fans, as well as Pokemon, Peppa Pig and PJ Masks. I was a little concerned over sizing when ordering my pyjamas. The options were 10-12, or 14-16. What does someone who’s usually a 12-14 order!?! Well, I decided to go with the 14-16 as I’m currently 28 weeks pregnant, and decided as the trousers have a drawstring on them, I can just tighten them and have a baggy top once Bus arrives in April (Bus is what Isla has decided we’re going to call this baby, by the way!) 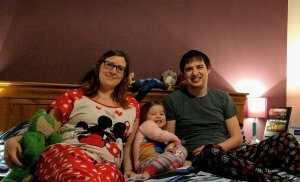 I decided Mickey and Minnie Mouse pyjamas for me would also keep Isla happy, as she is loving them at the moment. Chris was a little disappointed in general with the selection of men’s pyjamas. The site has about 20-30 fewer options for men than it does women…and a lot of them were out of stock when we were ordering. 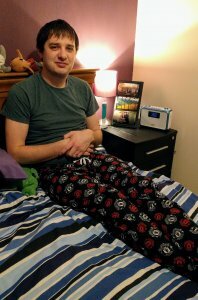 In the end Chris chose some Manchester United lounge pants as they were really the only thing in his size (medium) available. He was also a bit disappointed that the trousers don’t have any pockets in them. I’m not entirely sure why pockets are a must for pyjamas, but to him they are! Isla on the other hand absolutely loves her pyjamas, and doesn’t ever want to take them off in the morning! 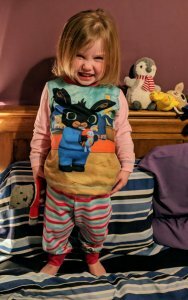 We chose her a pair of Bing pyjamas, as she is pretty obsessed with him at the moment (we recently went to see him at the theatre!) so I knew they would go down well. The promise of putting on her Bing pyjamas has saved us from a good few evening meltdowns since they arrived! I also decided to order some pyjamas for Bus. I had really wanted to order some Manchester United pyjamas for her, either a sleepsuit or pyjamas. But the site, being based in Birkenhead, only sells Liverpool or Everton baby/children’s football-related sleepwear. 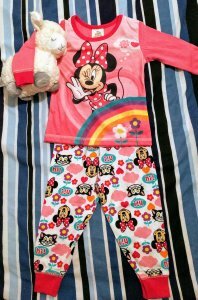 So, I decided to go for Minnie Mouse again, as the selection of pyjamas for babies was fairly limited. Isla has already tried to claim them as her own several times, and I’ve had to stop her from trying to squeeze herself into size 6-9 month pyjamas! I know you’ve always been on the little side Isla Bear, but you really won’t fit into those, trust me! They were super quick in dispatching and delivering my order. Ours arrived within a day or two of making the order, and at most you have to wait is 3 working days within the UK. On the whole, we love the pyjamas we received. They are super comfy, and a good fit. However the availability of stock, and selection of sizes was a little disappointing. 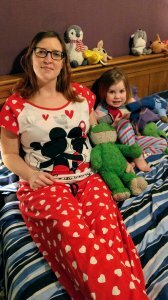 If you’re looking for children’s pyjamas, particularly ones with characters on, then this is definitely the site for you. And possibly, even if you’re looking for female pyjamas. But if you’re looking for men’s pyjamas I hate to say I’d probably look elsewhere. 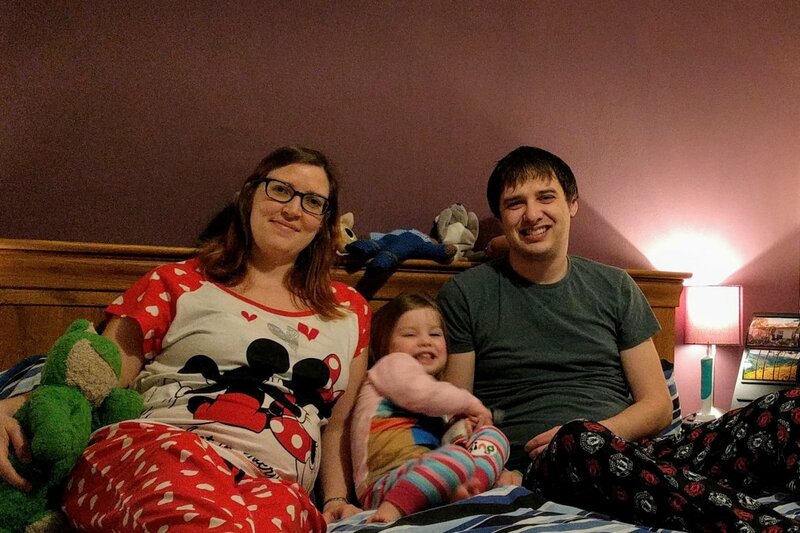 Disclaimer: We were sent these pyjamas in return for an honest review. All words and opinions are my own.